Atlantic Seabreeze: Matt Landry Band-CD-Are You Ever Gonna Go? 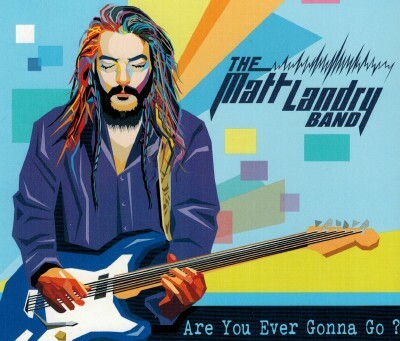 Matt Landry Band-CD-Are You Ever Gonna Go? The Matt Landry Band from New Brunswick have been nominated for an ECMA 2016 Music Award for Blues Recording of the Year. The 3 piece duo consists of Matt Landry, vocals, guitar, violin-Chris Landry, drums-Jermony Demont, bass. A fingers flying, hard hitting, jaw dropping 3-piece band that brings their original blues, rock material that takes each audience on a high energy journey that has floored audiences all over Atlantic Canada and Quebec. Matt Landry's guitar and electric violin playing is like a musical painter ceating a masterpiece as listeners stay glued to every riff, waiting for the last note to end so they can catch their breath. Matt Landry and his band just released their first studio album entitled, Are You Ever Gonna Go? and put on a show that leaves audiences wanting more. All songs were written by Matt Landry except, Pride & Joy, Leave My Girl Alone and Red House. The band has been busy playing at festivals, events, clubs and Universities promoting their album showcasing their original material and classic rock covers, which create an instant party atmosphere. This album is a great listening-to album and blues lovers are sure to like to have it in their record libary says Atlantic Seabreeze. The album gets a 5 star rating out of 5 stars on the rating list. To get more information regarding the band and their new album, refer to their website, address posted above.